We went to the beach today and found a small piece of driftwood. 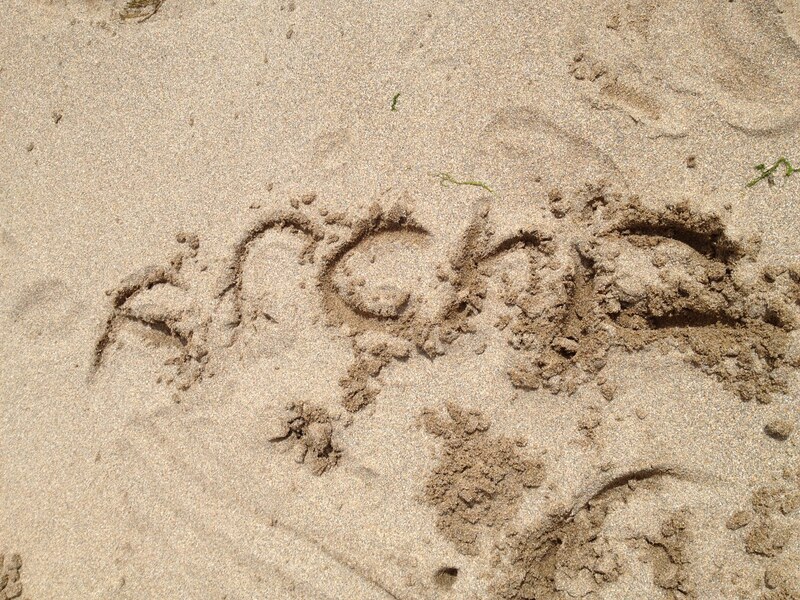 It was a handy size to hold, so I gave it to Archie and said ‘why don’t you write your name in the sand?’. And he did. Just like that. For the first time ever. Happy days. In 1986 I took part in Ten Tors. In my case this was a 35 mile, two day trek across Dartmoor in a howling gale and torrential rain for which I earned a bronze medal. Ten Tors dates from the 1960’s and was established to provide a challenge for civilians to tackle sleeping, navigating and field cooking on Dartmoor. It really is a challenge, a proper tough one. Dartmoor remains one of England’s greatest wildernesses and is recognised as a difficult place to navigate. The moors look very similar in every direction until you know it well enough to recognise the different tors and it can get very foggy very quickly. It’s also very boggy in places so walking in a straight line isn’t always wise – I remember a school friend disappearing up to her waist on one walk – once we’d stopped laughing we had to tie a rope to her to drag her out of the bog. Ten Tors has evolved to an annual event where 400 teams of six teenagers tackle 35, 45 or 55 mile routes across Dartmoor over two days, carrying everything they need and navigating and crossing the moor independently of adults. It takes a lot of training, back in the 80’s we undertook months of training, starting with day walks and including three practice camping weekends. It was a pivotal event in my teen years – aged 15 I could accurately navigate in thick fog and was able to look after myself in wild country. It gives teens a challenge – and an opportunity to be trusted – two days and a night on the moor without teachers or parents checking up on you (okay so there are army checkpoints but you’re expected to make your own decisions and are responsible for yourself). I’ve forgotten a lot of things I learned at school, but I still use my Ten Tors training today. So all in all a somewhat brilliant event. I’ll accept the embarrassment of looking like a boy (‘WOW mum you look like me’ as Joseph said) to post a photo from our finish line in 1986. So how does Ten Tors have relevance for Archie? Well Archie loves Dartmoor. One of the reasons we moved back to Devon was after seeing a 2 year old Archie running free and happy across the moors. Of course moving was followed by a year or two of Archie refusing to stand on grass which rather put paid to time on Dartmoor but we got over that. I started taking Archie up on Dartmoor regularly from about the age of 8. I encouraged him to walk in all weathers although he’d sometimes shut the car door and refuse to get out if it was really bad. A full on Ten Tors independent trek isn’t a possibility for Archie but he was able to take part in The Jubilee Challenge. The first event was held in 1977 and it now involves about 300 participants trekking across Dartmoor on the Saturday of the Ten Tors weekend. Like the mainstream event participants camp overnight on the Friday at Okehampton Camp before starting half an hour after Ten Tors at 7.30am. Jubilee Challenge participants also have the choice of different length routes and, like those taking part in Ten Tors can earn themselves a bronze, silver or gold medal. When Archie was given the opportunity to take part in The Jubilee Challenge by his school I jumped at the chance. As all the team were new to Ten Tors is was decided to do a shorter walk (7.5 miles) for a bronze medal. The team and staff headed up to Okehampton Camp on the Friday afternoon with a very excited Archie. He hadn’t been all that well in the few days before – he’d had a very sore and blistered tongue and I wasn’t surprised to get a call asking me to join the team late on Friday night. I rushed around the house a bit shouting ‘where’s my socks? Where’s my sleeping bag?’ before hot footing it to Okehampton Camp. I arrived just as it was getting dark, just as the wind was picking up and just as it started raining. The wind howled and the rain poured all night. I was slightly confused in the morning when I found the sides of part of the school base camp had disappeared. Although Archie had been awake from 2.30am I’d missed the tents falling down around us (different schools and groups) and so hadn’t felt the need to help. Archie did eventually fall asleep at 4.45am only to be woken at 5am by loudspeakers playing Chariots of Fire; a Ten Tors tradition I remember from 1986. I lay for a while in the sleeping bag I’d used in 1987 remembering when it had been my turn. Once I’d staggered out of bed I had to speed up a bit as we needed to be on the bus to take us to the start line at 6.15. A quick bacon sandwich later and we were ready. The weather started okay, but it soon deteriorated into 50 mph winds, rain, rain, rain and fog. I’ll add a gallery below – it was tough for the kids in places, but the team of six from Archie’s school all made it round. I haven’t included group photos because I’m not sure I’m allowed to, but really it was a great achievement for all the young people and the whole point of Ten Tors is to support your team and get round as a group – they did this wonderfully, helping each other around the course. It was an emotional moment for us all as they crossed the finish line. The conditions were absolutely atrocious and the medals were hard won. Archie’s is at the top of this post. It is exactly the same as mine from 1987. He thought this was wonderful. Roll on next year. I have very few photos of all the boys together in the early years. Partly because by the time I’d lined up the two youngest, Archie would have scarpered out of the photo but also because we didn’t really do a lot as a family. Archie at the time found neurotypical events difficult to handle & on the whole needed to spend his whole time moving. So even family trips to the beach or camping tended to break into two groups, one parent with Joe and Louis in one spot, paddling, playing football or whatever and the other walking into the distance with Archie. At that time I often felt as if we were had two entirely different families under the same roof. It was a time of contrasts, switching between planet autism and neurotypical land, with very little overlap. Gradually over the last few years the distance between the two worlds has decreased and most of the time now we just have our family time. Okay it’s not always a typical family, but we can go out and eat together, we can shop together, we can go horse riding, surf together & ride bikes together. This is reflected in the family photo albums where all three boys can be seen enjoying life together, creating joint memories. It’s entirely normal for us now to do most things together and it’s rare to get that sense of planet autism vs neurotypical world. There are times when there are reminders – attending in quick succession a secondary school carol service in a candlelit church or watching a mainstream primary nativity, versus the warm chaos of Archie’s school christmas celebrations for example was a reminder amongst others that there are still differences. There are still things that Archie can’t do. Not many, but cinemas and theatres are still a no go area for him. Which brings me onto this week. Joseph was performing in the UK Priscilla Queen of the Desert tour for the third and final time. This is what we tend to refer to between ourselves as extreme neurotypical parenting, as it’s really a large step away from anything we experience with Archie. He absolutely loves the Priscilla CD but still wouldn’t be able to watch a performance in a 1000+ seat theatre. The weeks that Joseph takes part in professional theatre shows are always warm, sunny weeks, full of family and friends going to see the show and this week was no exception. Because it was Joseph’s final Priscilla week, I agreed he could see the show. The final matinee of the tour was a lovely way to end a really fun week – the sort of week when you realise just how much fun parenting & well life really can be. We arrived home after the show, both of us on a show inspired feel-good high; Joseph decked in pink feather boas and wearing a Priscilla cap and found Archie a bit angsty. This eventually led to a very major meltdown at about 8pm. Suddenly the chasm between the two worlds felt very large indeed and the high of the previous week crashed. It felt as if we were being launched from one extreme to another. One of the problems with meltdowns is that it can be very hard to understand why they have occurred. We focussed on getting the house calm and encouraging Archie to sleep. This morning Archie again woke very anxious and a further meltdown followed. I tried to talk to him about what was upsetting him but he finds talking about negative emotions incredibly difficult. This is recognised, and is and is being targeted by school as well, but like everything it’s a long process of short steps. I tried to put myself in his shoes and realised that I’ve been out a lot more than usual in the last week watching Priscilla and family and friends have been coming and going and he might find the changes and my absence difficult. I explained to him that granny and grandad Ireland were back in Ireland and that Joseph’s theatre show was over. He latched onto this – repeatedly saying ‘different day’ and seemed happy when I replied that yes, Joseph would be at the theatre on a different day, not for ages and that I was going to be home most of the time again. If my absence was the issue it is of course something we need to keep an eye on – I can’t be unable to go out, but this morning it was a just a relief to see some of the anxiety go. I took Archie to the beach with me to walk the dog. Richard was a bit concerned – with good reason. The beach was busy, and public meltdowns or meltdowns while driving are hard to handle. However, it was the right decision. The tide was out and as we walked I could see Bigbury working its special magic, the anxiety dropping away and my smiley boy returning. We returned home and Archie has been wandering around this afternoon carrying a pink feather boa wearing Joseph’s Priscilla cap. The gap between the two worlds is decreasing again. We’re easing back into our funny family life. Mumsnet is launching a new campaign today called This Is My Child. There have already been a couple of national media articles about it in the Guardian and on the BBC website. I was asked to write a guest blog post about going out with Archie which can be read here. The aim of the campaign is to challenge negative attitudes towards those with disabilities and bust a few myths (such as autism is just an excuse for poor behaviour). Being run by Mumsnet it has a chance of reaching a wide audience and I hope educates a few, or even many. In the early days and even sometimes now, being surrounded by a sympathetic general public may have saved my blood pressure or tears on more than one occasion. This is one aspect of an awareness campaign. Over the years my own drive to raise awareness has changed a little. 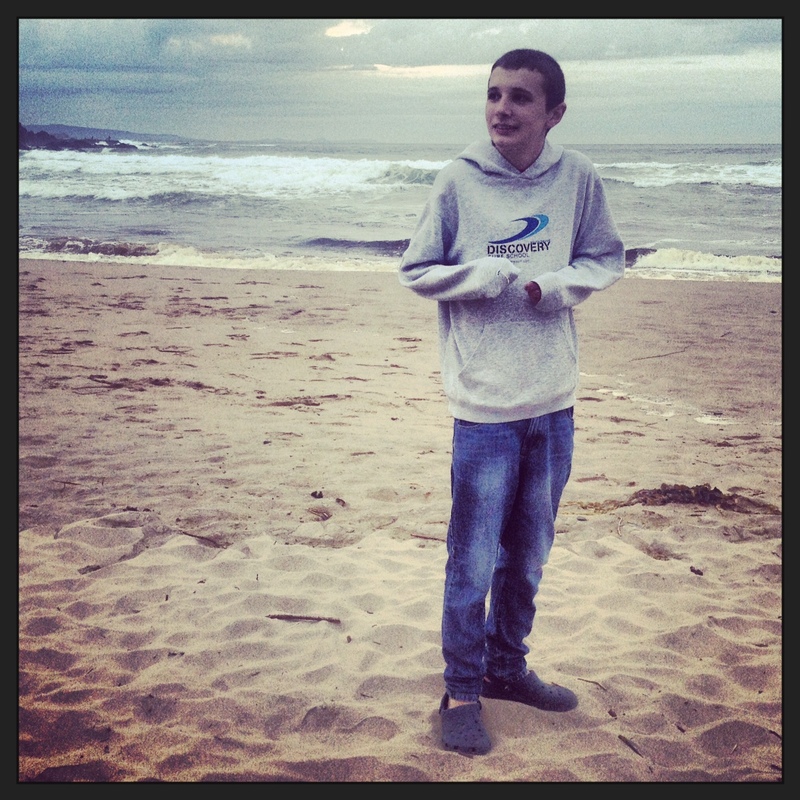 Initially I just wanted people to know and to understand what life was like with autism, and to cut us all some slack. Now it’s a little different. I want people to understand that Archie is someone worth knowing. He has a great sense of humour (yep, despite that severe autism). He’s a thrill seeker (roller coasters, and he surfs much bigger waves than me) and he’s intelligent. 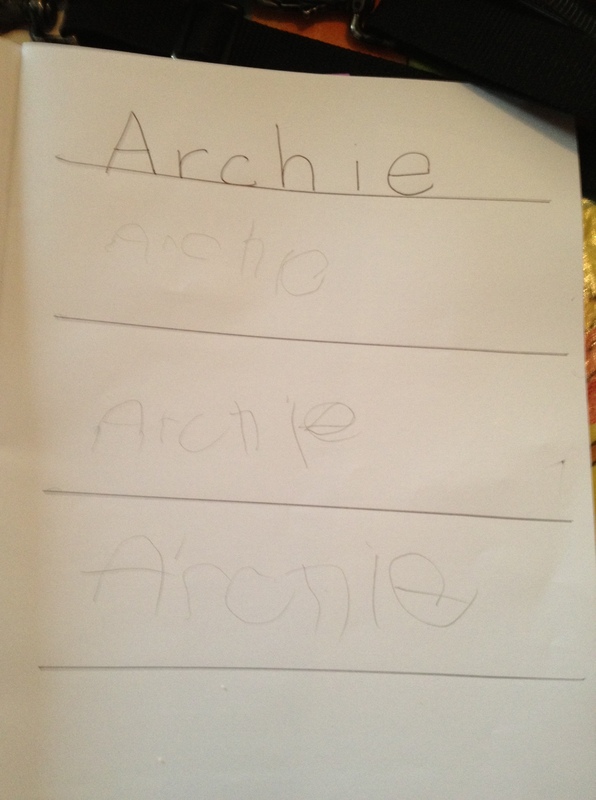 Faced with the behaviour of someone with severe autism this last point can be hard to understand – to be fair it took me a long time to realise just how clever Archie is. His behaviour does hide what is going on inside, although with the talker and the computer it’s getting easier for him to demonstrate that there is quite a lot going on in there. The publication of books such as The Reason I Jump help spread this message of unrecognised intelligence. As previously mentioned a writer/director friend and I have developed a film project that tells the story of a young person, not Archie but not unlike him and his blossoming into living a full life where his abilities are recognised and valued. The script has been read (and loved) by some well known and talented actors who are keen to come on board. Like many film projects funding is an issue, so, if you fancy funding a film please get in touch. A general recognition of Archie and others like him, having lives worth living is perhaps my biggest wish for now. If people approached those with disabilities with this understanding things might change. The Mumsent This Is My Child campaign is a step in the right direction. Joseph finished primary school this week. Come September he’ll be off to secondary school with 174 people in his year group – more than the total number of pupils in his current school. A time of change, and it has been a week of reflection. We have been lucky with the boys’ schools. Apart from a dodgy few terms when Archie was in mainstream (and to be fair that wasn’t entirely the school’s fault – Archie should never have been there) the boys’ have been in supportive schools who have done their best to help them reach their potential. In Archie’s case that potential seems to be expanding rapidly and I’m not quite sure where we’re going to end up. Year 6 were given a warm send off. A close group of friends, there were tears when it came to say goodbye and a rather idyllic final barbecue overlooking the sea, with water fights, British bulldog and a swim in a sea pool. The children were given some lovely gifts including a jar of questions each from their class teacher. 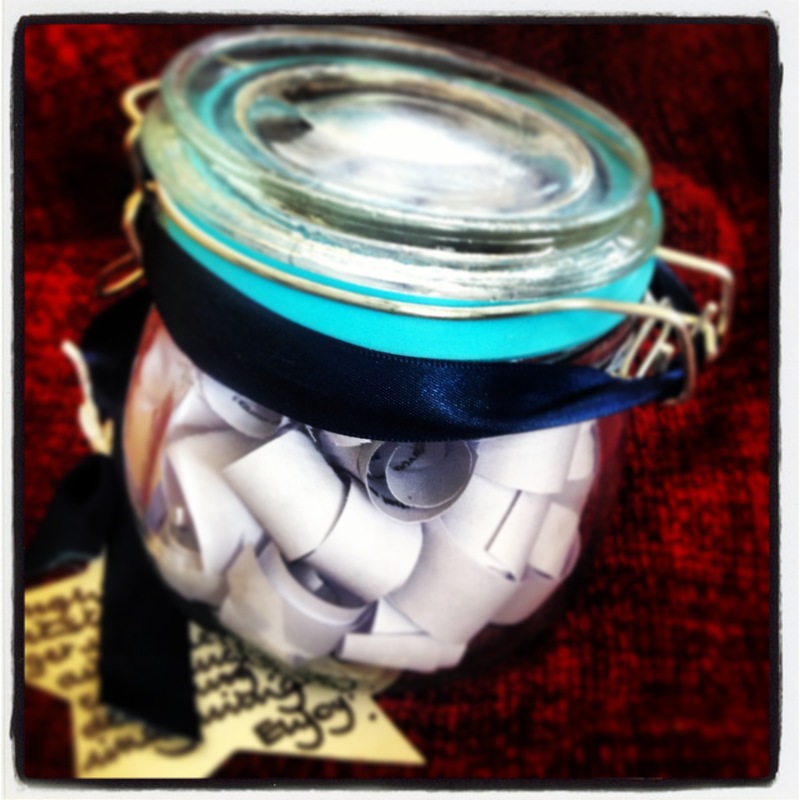 The note attached to the jar says that the questions are designed to get the children chatting and debating with their friends and family. They range from simple questions such as ‘what is your favourite place in the house?’ (Joseph: the computer room; Louis: the front room because I watch TV in there) to more abstract ones such as ‘if you could have any superpower in the world what would it be and why?’ I’ve put it on the kitchen table to encourage meal time conversation. It’s a thoughtful gift for any family. I thought Joseph might need to be a bit older to appreciate the value of such a gift but he was genuinely delighted and was keen to get started with the questions. It’s a particularly useful present for our family because Archie often finds these sorts of questions difficult. Most of his conversation is concrete, usually about what he’s doing, or has done and when. I asked him earlier today what his favourite food was and he struggled to answer. Archie eat; Archie like food; eat food tomorrow were the initial answers before he said sweeties. Many of the questions in the jar are great for encouraging Archie to start to understand, think about and answer these more abstract questions, where he has to express a preference rather than provide an absolute right or wrong answer. He did well with ‘what is your favourite room in the house?’ and answered bathroom pretty quickly. He may not understand the concept of superpowers yet but he was included in the conversation and made his own contribution mummy car. A question about whether you would prefer to live on the moon or in the ocean led to a great debate between Joseph and Louis centring mainly on available food. I translated a little for Archie asking him which he preferred, the moon or the sea and he said sea which surprised me a little, maybe he recognises the effect the full moon has on him! 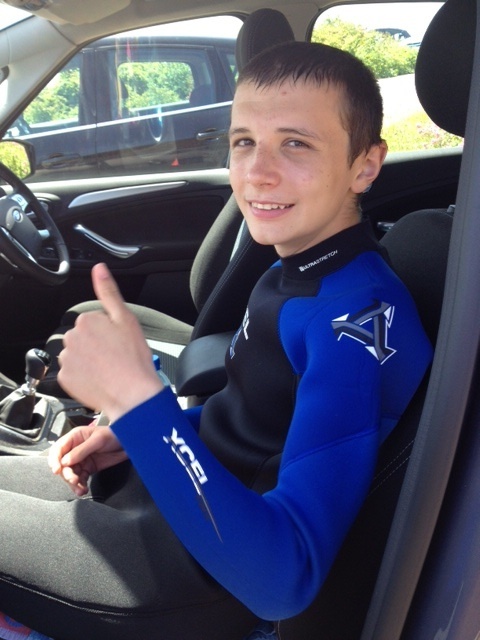 Maybe he just wants to go surfing again, life has intervened and we haven’t been for a while. While many of the questions may be a little out of reach for Archie at the moment, through being asked to contribute and through being part of the conversation I expect him to find them gradually easier to answer. Language cannot be learned passively, it is only through using language that you learn to wield it. These mealtime conversations provide an opportunity for Archie to take part in describing preferences and in debating without the attention being solely on him. He can hear other people being asked the same questions and listen to their answers. He can begin to understand that we are interested in his answers as well as his brothers’ and he can learn that questions aren’t always asked as part of an assessment and aren’t always designed to trip you up and reveal what you don’t know. It is a way in which we can show that we are assuming competence, something which Naoki writes about in The Reason I Jump. Incidentally, slightly off topic but this is a subject close to my heart and I co-authored a book chapter published this month on the issue of competence (Laughter and Competence: Children with Severe Autism Using Laughter to Joke and Tease in Studies of Laughter in Interaction). Whilst I am aware that Archie doesn’t (yet) have the means to always express himself in a way that is easily understandable and that he sometimes needs help interpreting questions I can see the question jar becoming an important family tradition. I am already hatching a plan to get everyone to contribute new questions when we’ve worked our way through the originals. It is interesting for all of us to think about our answers and explain or defend them. To have Archie able to take part in this is wonderful. From expensive high tech talkers to simple jars of questions other people’s gifts are having a large impact on our lives.